This contemporary hillside oasis was created with total luxury in mind. The invisible melding of indoor and outdoor spaces is flawlessly and impeccably designed. Behind an artful security gate, and through a massive solid glass front door, this 4 bedroom, 6 bath resort-style home is private, state-of-the-art, and immaculate. 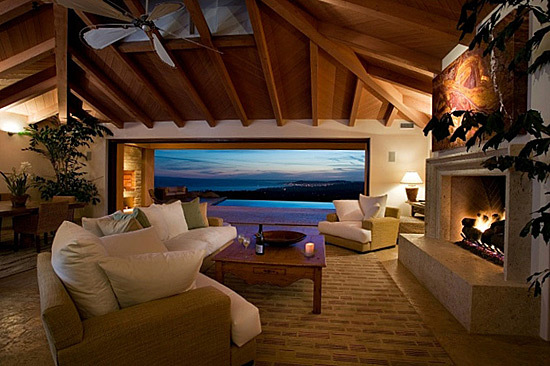 The Great Room defines this home with 5-star resort ambiance. 30 feet of glass sliding doors disappear to expose unobstructed vistas. Relax as you watch a sunset soften the colors of the city, the harbor, the ocean & the islands. Clearly, al fresco living is the central focus of this amazing retreat. In the Living Room, comfortable oversized seating surrounds a one-of-a-kind Texas shellstone hearth and fireplace. An impressive slab of Onyx above the fireplace is illuminated from behind to provide soft ambient light. Soaring open beam ceilings of sandblasted Douglas Fir rise to the center of the room. Throughout this home, the owners love of beautiful things is evident. The kitchen is spacious and smart with professional Viking appliances, natural honed travertine surfaces, mahogany cabinets, 2 pantries, and a flat screen TV. The expansive breakfast bar seats six, and is a great vantage point to watch gourmet preparations. A breakfast-nook table seats up to 6, and is adjacent to a convenient built-in office work area. Formal inside dining for 8-10 centers around a solid wooden table; hewn from radiant African Sapele hardwood. Another dining table on the veranda is adjacent to the outdoor fireplace, which doubles as a wood burning BBQ grill. To complete the outdoor dining and entertaining options, there is a custom oversized Palapa. This hand-made masterpiece houses a large onyx dining table which comfortably seats 10. Lit from underneath, this unique table creates a soft luminescence by which to dine. On chilly nights, the heated slate floors keep guests from moving inside. The nearby wet bar, also of onyx, adds to the entertaining value of this patio location. The Master Suite, an extension of the veranda, is soothing and tranquil. The corner design takes full advantage of the spectacular views. Disappearing glass walls provide open access to the infinity pool and spa (Note: the solar heated pool will not be heated in winter months. Temperature may vary, even in warmer months, as the heat is strictly generated by the sun). The Master Suite features "his" and "hers" bathrooms. "Her" bathroom with private bidet, centers on the large oval spa tub with colored lighting and unique ceiling-mounted tub fillers. The glass enclosure of the large walk-in shower offers a variety of bathing choices with dual shower heads and vibrant body spray. Consistent with the open air design of this home, access to the outdoor spa, pool and patio is a matter of sliding open more glass doors to bring the outdoors in. "His" full bathroom has the added amenity of a steam room with oversized rain shower head. A room-sized walk-in closet is accessible from both bathrooms, and offers enough open space for a crib and toddler play area. On the south wing, a 2nd floor Media Room/Office is luxurious and open with a fireplace, 60" flat screen TV with surround sound, a full bath with spectacular coastal views, and a walk-in closet. This room also features a King-size sofa sleeper. Massive sliding glass doors disappear to allow this large indoor space to blend seamlessly with scenic ocean views from the wrap around view deck. Also in the South wing are two Junior Suites, each with its own bathroom and walk-in closet. In the hallway leading to the suites, guests can search for the entrance to the secret wine cellar. The exclamation point to this breathtaking property is the 360 degree view from the circular front lawn. Let Villa Carrera, a one-of-a-kind resort retreat, become your private paradise. Luxury, seclusion, and tranquil beauty await you above the sweeping coastline of Santa Barbara.